Geese flying in a V-formation have always been a welcome sign of spring as well as a sign that heralds the coming of winter. Not only is this a marvelous sight, but there are some remarkable lessons that we can learn from the flight of the geese because all that they do has significance. As each goose flaps its wings, it creates an uplift for others behind it. There is a 71 percent more flying range in V-formation than in flying alone. Lesson: People who share a common direction and sense of purpose can get there more quickly. Whenever a goose flies out of formation, it feels drag and tries to get back into position. 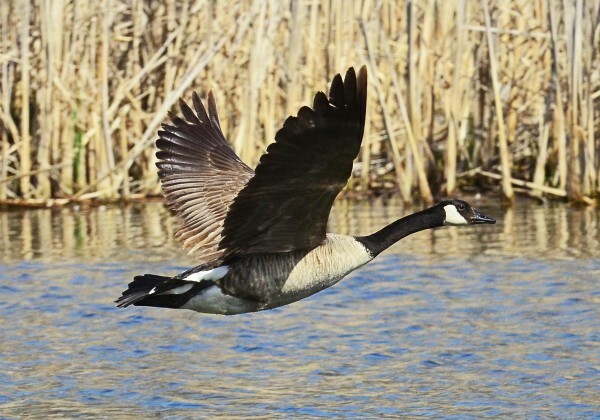 When the lead goose gets tired, it rotates back into formation and another goose flies at the head. Lesson: Shared leadership and interdependence give us each a chance to lead as well as an opportunity to rest. The geese flying in the rear of the formation honk to encourage those up front to keep up their speed. Lesson: Encouragement is motivating. We need to make sure our “honking” is encouraging – and not discouraging. When a goose gets sick or wounded and falls, two geese fall out and stay with it until it revives or dies. Then they catch up or join another flock. Lesson: We may all need help from time to time. We should stand by our colleagues in difficult times. My source of inspiration was RavensCourt Gardens. This is such great advice! I am happy my post was an inspiration. I am thinking a a lot about community lately. We hired a young man with a wife and young son that had been homeless for quite a while, bouncing between relatives and week to week motels. We helped him with a loan for rent and I put an email out to friends asking for donations of house hold goods. It has been an amazing experience and peoples generosity as been wonderful. That caused me to think what it means to really function in a positive way with a diverse group of individuals be it a work, home, neighborhood, city etc….my generation of baby boomers are aging and I wonder (hope) if they will see the light as they find themselves nearing the end of life here on earth and see that money is not a goal or the most important thing! I started a company 5 years ago with my husband. We do need to make money to pay bills…but it is not our goal. We give work to people that need it and help them learn a trade, we donate our services to the community, we teach young folks how to garden organically, we see ourselves as stewards of the earth and we hold ourselves to a high standard of service, loyalty and honesty! And it is working : ) and the bills do get paid but more than that we feel blessed to go to work and do our job! I am sorry. I did not realize this was not an already approved message. Usually these have been coming out before I have a chance to approve them, but for some reason this one was not. I had seen your site some time ago and kept going back to check to see new articles, but did not know to “follow” you in my reader. I am and have been a “learn the hard way” blogger. Your whole site looks so nice and thanks again for commenting here. I wonder if your young apprentices are appreciative of all you do for them. You may find this hard to believe, but one year I taught at a school where there was a lot of infighting. I thought to help some to think more about being helpers and not hindrances, so I made a nicely formatted copy of this page, laminated it and put it in all the mail boxes in the teacher’s lounge. Well, there was an inquiry at the next teachers’ meeting and they wanted to know who had done this. I had no clue it angered some, so I “owned up” to it. I came very near getting dismissed for daring to try to “indoctrinate” without going through the secretary first. Therein lay the problem of the infighting. Some people are just over-sensitive. Seriously. I have no idea what went on before I arrived, but something made the atmosphere pretty tight there. April, sorry not to see this comment until now. Thanks for the encouragement and for taking time to read. I appreciate you.